I contend there is simply nothing more liberating than getting naked and jumping into an unfamiliar body of water. So you can imagine my excitement and reaction upon seeing the Arctic Ocean for the first time. It was as if Destiny herself had arranged this meeting, for the ocean was in the prime of its glory, covered by thick, pearly white ice but for a few meters around the driftwood-covered cobblestone beach. Off came the clothes, and into the water I went. For a brief moment I never felt so stunned… and never felt so alive. Jumping in the Arctic Ocean was just one of the many astonishing experiences I had while living on the North Slope of Alaska for three of the most exciting, novel-experience-filled, showerless, nightless, treeless months of my life (see Life On the Frontiers). But when the North Slope started to feel like home to me, I knew it was time for me to pack my bags and head for new territories and experiences. I asked my employer to let me leave the North Slope a week earlier than planned in order to allow me to see more of Alaska before returning to school. Though confused about my method of travel, he agreed, and so it began – I set off to see the ‘rest’ of the largest and least densely populated U.S. state … by bicycle. Because I didn’t have the time in a week to cycle back to Fairbanks along the 415 mile route I came – the Haul Road, the primitive, gravel, sole road into the endless treeless tundra of the North Slope – my plan was to fly to Fairbanks and cycle the ~375 miles to Anchorage. Flying in Alaska is at once essential for transportation in a state that has towns blocked by mountain ranges and no roads into them, and an affair in which the odds of survival are far from certain. In a state so expansive and undeveloped, the vast majority of residents and visitors often find that the need to travel outweighs the risks involved. Even after making countless helicopter rides through thick fog over the last three months on the North Slope, I nonetheless felt a bit queasy taking off for Fairbanks from a tiny airstrip just a few meters south of the unpredictable winds of the Arctic Ocean. However, once in the air I was privilege to sights of beauty that remain inaccessible for ground-based creatures. Flying over the Brooks Range, which is the northernmost continental divide in the U.S., was especially humbling. The landscape is full of mountain peaks interspersed by valleys of braided rivers, and every peak is tiny; a few have snow on them. Yet, they didn’t feel tiny when climbing them. I realized that on every clearly defined ridge I spotted, I would not even be able to see a hiker like me on top of one of them. It’s easy to get lost in the vastness of this landscape, and that’s part of what makes it so appealing for adventurers. The story of the Brooks Range starts far before adventurers climbed its trail-less, rocky peaks. The rocks that now make up the crumbling slopes were formed under the oceans of the Paleozoic era (the name ‘Paleozoic’ coming from Greek words meaning “old” and “life”) – between 550 and 250 million years ago. During that time an abundance of marine life, including organisms like corals and invertebrates which can be found fossilized in the rocks today, lived and died along the passive (not tectonically active) ocean margin butted up against a continental plate, their bodies piling on top of one another. Because these organisms created hard shells of the mineral calcite (calcium carbonate), their bodies were preserved and lithified, or made into the rock called limestone. Since the Paleozoic, these limestone rocks have been uplifted by tectonic forces (the same suite of forces and movements that cause earthquakes and erupt volcanoes) to form the Brooks Range. The formation of rocks underlying the range, however, has remained a mystery to science – the range is too rugged and inaccessible for most major field studies to take place. Interestingly, the underlying rocks of the North Slope are some of the most intensely studied rocks in the world! Why? Well, around 200 million years ago this area was also underwater – but the organisms, mostly plankton, that died and were buried here formed rocks more interesting to humans than limestone – they formed oil. Lots of it. The North Slope oil fields are the largest in North America, and are studied in order to extract this precious resource. Before I knew it, I was in Fairbanks. It was strange seeing unfamiliar faces, the buildings, and trees! After staying a night in a hostel, I loaded up my bike and took off through the tectonically-scrunched, rolling landscape around Fairbanks. With fresh legs and a full spirit, I decided to break off from my main route to take a backwoods road lined by tall evergreens. I began to climb… and climb… and climb. For the next hour I wore myself out climbing, but when I finally reached the peak of this sparsely settled mountain I was rewarded with a small clearing in the trees, giving me a view of the late summer landscape below. Past the pink flowers colonizing the clearing emerged a landscape of yellows and greens overlain by a light blue sky filled with perfect white clouds. I felt a bit like I was in Heaven for a few moments. However, I suddenly became acutely aware of my surroundings. Something felt very wrong. I turned around and peer into the dark shadows cast by the thick forest behind me. The world got strangely still. Slowly crawling across the forest floor crept a black paw. It came to a calculated rest as I noticed two silver eyes above it staring into my soul. I took off like a rocket down the other side of the mountain I had just climbed. The hard law of safety in Alaska – to never run from large predatory mammals – didn’t enter my mind for a moment. I sprint-pedaled with my heart racing and every ‘flight’ response nerve in my body firing. As the wind whipped past my ears I glanced back and for a split second lay eyes on the outline of a large, black, curious wolf in the middle of the road, head cocked to the side and tongue out lazily to one side. Wolves, and all large predators, are now understood to be an integral part of ecosystems; further, wolves in particular are not much of a threat to humans. In the entirety of the 20th century, there were three human fatalities in the U.S. related to wolves, all of which had rabies. For comparison, there are 16-18 dog attacks per year in the U.S., so in the time that three wolf-related deaths occurred, ~1700 dog-related deaths occurred. But the wolf hunting continued in the West despite the young man’s warnings, and by 1926 the last of the wolves of the West was dead; and so the deer and elk herds grazed the land to the down to the dirt, making the park look more and more like a wasteland. The future of the park began to wash to the sea with no vegetation to hold it down. The good news is that in the mid-1990’s, wolves were re-introduced to the Yellowstone area, restoring the natural balance of the ecosystem. However, the sad truth of the matter is that large predators once existed all over the U.S., and that this process is occurring everywhere the empty void of the great predators is still painfully felt. Returning to my planned route and resolving to stick to it, I continued onward. I soon crossed a small stream that caught my attention because of a discoloration of the water – it seemed to be stained red. Further, the water seemed to be alive – moving. I stopped to investigate. The road had a large tunnel under it made out of wavy steel through which the stream passed. As the fast water sped out of this tunnel, it tumbled down a series of a few rocks and slowed back to the stream’s natural, meandering pace. At the base of the tumbling water, what must have been hundreds of foot-long red shadows swayed back and forth. Suddenly, a huge, bright red salmon leapt from the stream water and with several bursts of furious tail pumps managed to propel its streamlined body through the onslaught of water and hop to the next set of rocks into the tunnel. At this point he lost all energy and lets his body go limp as the stream carried him back down to where he started. I sat and watched many of the salmon attempt to make it through the tunnel to their prided spawning grounds – the place where they were born and will end their lives and thus recycle their body’s nutrients to begin so many other lives, including those of not only more salmon but also trees, wolves, bears, sharks, and the entire living ecosystem, really. Further, the reproductive success of these salmon determines the livelihood of many Alaska residents themselves, as often the economies of entire towns like Cordova depend on salmon. I watched these salmon for a half hour. Not one made it past the tunnel. 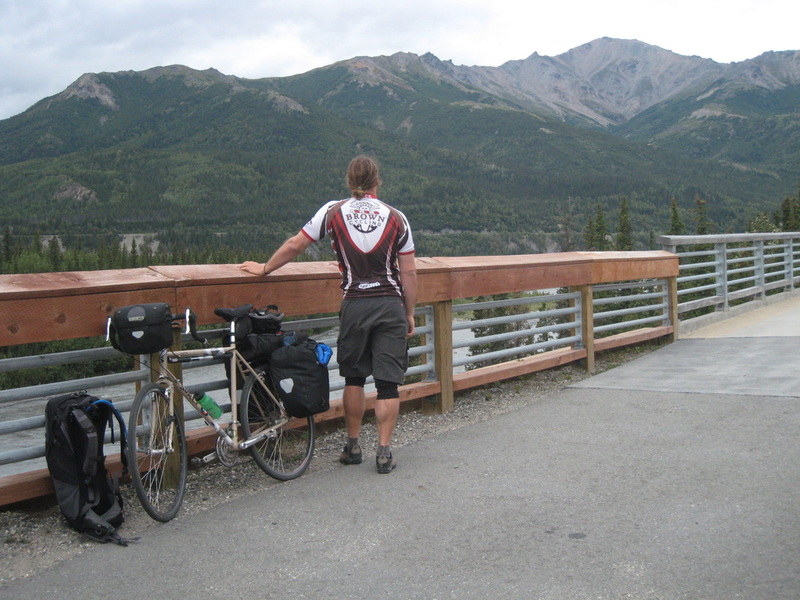 Back on the road, I pedaled through flat plains with sparse trees towards the Alaska Range visible through stormy clouds on the horizon. The road seemed to go on forever and I stopped for the night in a hostel. In the morning, I was worn out but continued to pedal South with all my remaining energy. The landscape began to roll as I approached the Alaska Range, and suddenly, I was crossing a bridge over a yellow- and gold-walled canyon with rushing whitewater of the Nenana River filling the basin; it was the most beautiful site I had ever laid eyes upon. The family members glanced at Denali Dan with wide eyes, and proceeded to turn to me and widen their eyes further. This whole sequence repeated itself a few times as the family accepted the fact that they were to be rafting with two men that look more like lifelong hobos than rafting companions. Denali Dan then gave his safety briefing, and into the swift, dark blue and white waters of my dreams we went. The waters of this section of the Nenana River are swift as a result of the rocks around it – the broad, wide river of the open landscape’s plains is confined to a small canyon here in the uplifted mountains of Denali National Park. Confining the large mass of water into this small space causes the water to shoot rapidly through the canyon, making it a great place for rafting! This effect of the canyon on the water speed is known among scientists as Bernoulli’s principle, and it is in fact the same effect that allows airplanes to liftoff and fly! Just as the uplifted rocks in this area shape the characteristics of the river, so too does the river shape the rocks. The majority of these rocks are sedimentary – formed by particles of rocks that are eroded (sediment), carried away, deposited somewhere, and eventually ‘lithified’ into rock. Like in the Brooks Range, we can tell from observing these rocks – many of which are limestone – that the area that is now Denali was once all underwater and has since that time been uplifted by tectonic forces. Unlike many igneous (melted and then cooled and crystallized in volcanic processes) or metamorphic (subjected to high pressure or temperature causing a change in the strucuture) rocks, sedimentary rocks are easily weathered – thus, when the waters of the Nenana crash into them, particles of these rocks are eroded away and carried with the river. Eventually, the structure of the entire canyon changes as a result of this process. Denali Dan and I began to tell the family about the geologic history of the area and explain prominent features in the canyon according to their geological formation. Once the family seemed to grow accustomed to being informed by men whom they believed were hobos just a few moments ago, the discussion naturally turned to the focal point of Denali National Park – the mountain. Denali, meaning “The High One” in Athabaskan Indian dialect, is the highest mountain in North America standing at an astounding 20,320 feet. Unlike most of its sedimentary neighbors in the Alaska Range, Denali is composed of igneous rock (melted and then cooled and crystallized in volcanic processes) – granite, to be precise. The mountain was born 56 million years ago when volcanic activity in the park crystallized the granite that is now Denali by pushing it upwards and cooling it just beneath the surface of the Earth. The mountain is still being pushed up by tectonics today at a rate of 1 millimeter per year – quite unnoticeable on a human lifetime, yet quite a speedy rate on lengthy geologic timescales. Almost as if in pity of my childish stupidity, the clouds parted further and gave me just slight glimpses of the real Denali – gargantuan bright white slopes looming over the rest of the landscape covered with glaciers that flow to its base on geologic time like water flows on human time. It looked like the gates of Heaven guarded by the craggy, dark peaks of Hell. (Re-Introduction fact) “Ten Years of Yellowstone Wolves,” Yellowstone Science, Volume 13, Winter 2005.